The mechanism by which atomic vibrations transport heat through an amorphous material or a glass has been a long-standing problem in condensed matter physics. Proposed mechanisms range from that of a minimum thermal conductivity where the Boltzmann equation is used with the mean free path set to a "lattice" constant, to a "fracton" model in which heat is transported by anharmonically assisted hopping of localized vibrations, to diffuson-like conduction, with heat transported mainly by extended states but which do not have "good" wavelengths. Hydrogentated amorphous silicon (a-Si:H), a good solar-cell/photovoltaic material, has a structure qualitatively similar to ordinary glasses as it has local order, but no long range order, and with few exceptions, other physical properties that are also consistent with those of ordinary glasses. An apparent universal characteristic of glasses is the existence of "tunneling states." More than 10 years ago, however, it was discovered that certain thin a-Si:H films (a few microns thick) made by the hot-wire chemical vapor deposition (CVD) technique at the National Renewable Energy Laboratory showed crystalline-like internal friction at low temperature, meaning that the films had almost no tunneling states. In recent work published in Physical Review Letters, a group led by Carnegie-CDAC visiting scientist Joe Feldman (NRL) shows that the thermal conductivity of a-Si:H thin films betweeen 80 and 300 K is probably at least a factor of two greater than measured on most other amorphous silicon samples. Measurements were performed on an 80 micron sample grown by the same hot-wire CVD technique using time-domain thermoreflectance (TDTR) spectroscopy. The TDTR spectra show a clear laser intensity-modulation frequency dependence, which provides experimental evidence that phonons with a mean free path of ~ 100 nm make a sizeable contribution to the thermal conductivity at room temperature. The experiments were done at the University of Illinois - Urbana Champaign in the laboratory of Professor David Cahill, who is also involved in CDAC through collaboration with center partner Professor Jie Li. 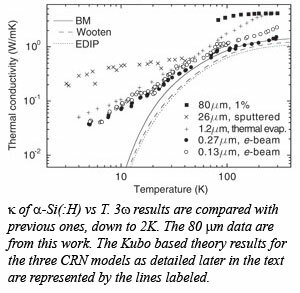 Currently available structural models and associated theoretical methods, however, have thus far failed to account for the large thermal conductivity measured for this sample, in particular the nearly 40 percent contribution from phonons with a mean free path between 100 to 600 nm as inferred from the TDTR measurements [X. Liu, et al., Phys. Rev. Lett., 102, 035901 (2009)].